Holiday Peking Duck with kumquats (served with or without Mandarin pancakes) at Departure restaurant and lounge in Portland, Ore.
Calamansi, kumquat and yuzu are foreign fruits to many American diners. But these and other Asian citrus may soon become more familiar as chefs who love their unique, and sometimes complex, flavors are adding them to cocktails, entrées and desserts. 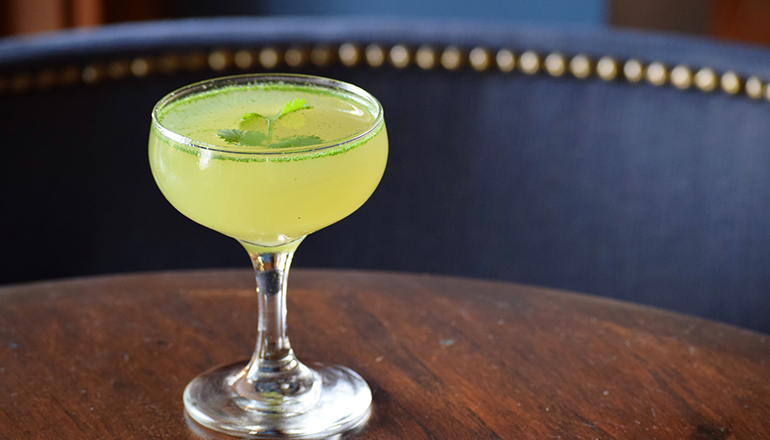 At Cindy’s, Khaund opts for calamansi — a green-skinned fruit known as the Philippine lime — to make the Golden Lime mocktail, which also includes honey, fresh tarragon and soda. The light, refreshing beverage is easily transformed into a cocktail with the addition of Ron Zacapa and Cruzan Black Strap rums. At Three Degrees in Portland, Ore., lead bartender Joe Davis shakes up a Cilantro Cocktail with tequila, agave, “nitro-muddled” cilantro (frozen with liquid nitrogen to preserve its bright color and flavor) and yuzu, a lemon-like Japanese fruit. The Cilantro Cocktail with tequila, agave, “nitro-muddled” cilantro and yuzu, at Three Degrees in Portland, Ore.
At Rice & Gold in New York City, chef and partner Dale Talde showcases a plethora of Asian citrus in a dish that’s simply called Citrus Fruits. 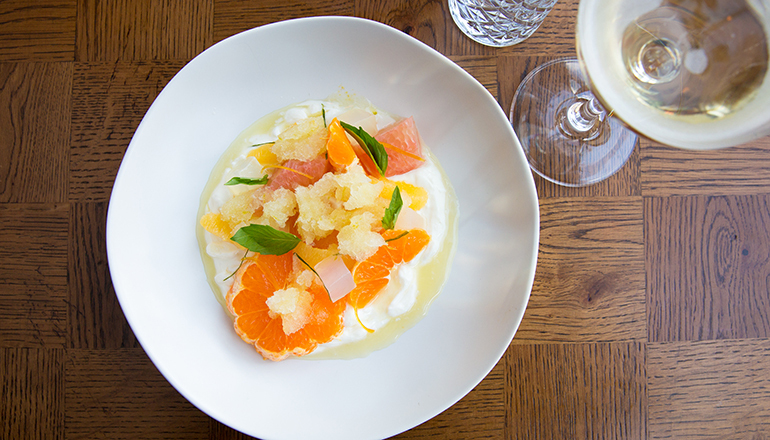 Pomelo — a large Southeast Asian fruit similar to a less bitter grapefruit — clementine and Meyer lemon are served over cardamom labneh with calamansi and yuzu granité. At Rice and Gold, Chef and Partner Dale Talde’s Citrus Fruits showcases pomelo, clementine, calamansi, Meyer lemon and yuzu. Kumquats — small, oval-shaped citrus with sweet, edible skin — are the preferred citrus of Chris Starkus, executive chef at Urban Farmer in Denver, who said it represents good luck in many Asian countries. Starkus likes to use this wintertime fruit when he changes the steakhouse’s menu at the end of summer. For example, on his menu in mid-October was a black cod entrée garnished with kumquats and delicata squash, tossed with Marcona almonds and an herb purée. It will remain on the menu until spring arrives. In December, chef Gregory Gourdet of Departure, a Pan-Asian restaurant and lounge in Portland, Ore., will offer his annual holiday Peking duck with kumquats. An alternative take on classic holiday meats, such as turkey or pork, the duck is cured, blanched in honey and Chinese wine, and served with a housemade plum sauce, kumquats, scallions, hoisin and cucumbers. Following tradition with Peking duck, Gourdet serves the dish with thin pancakes to wrap the duck and accoutrements. Also serving duck with kumquats is chef Nick Leahy of Saltyard, a small-plates restaurant in Atlanta. When the sweet-and-sour fruit is in season, Leahy likes to pickle it and serve it with duck. At the Korean-inspired, family-style restaurant Atoboy in New York City, chef and partner Junghyun Park prefers to serve kumquats with shellfish. For a clam entrée, steamed and shelled littlenecks are placed in a white kimchi juice and mixed with Korean pear and kumquat, sprinkled with puffed buckwheat, and drizzled with lemon oil and micro sea grass.